There’s nothing better than a simple salad after an overindulgent Thanksgiving meal. This particular recipe shines the spotlight on cauliflower, a vegetable whose flavor and attractiveness I find to be vastly underrated. Growing up, I only saw cauliflower in one of two ways: steamed (with absolutely no flavor) or covered in cheese (decidedly delicious, but not the healthiest of options). This cauliflower recipe takes a different turn, relying on roasting to give the vegetable an almost popcorn-like flavor. While prepping my cauliflower for the oven, I decided to supplement the salt and pepper with a healthy dose of curry powder. Curry powders vary widely, so the variety that you choose will have a powerful impact on the flavors of this salad. I opted for one with a healthy dose of fennel seed, but I’m sure that whatever you have on hand will do. 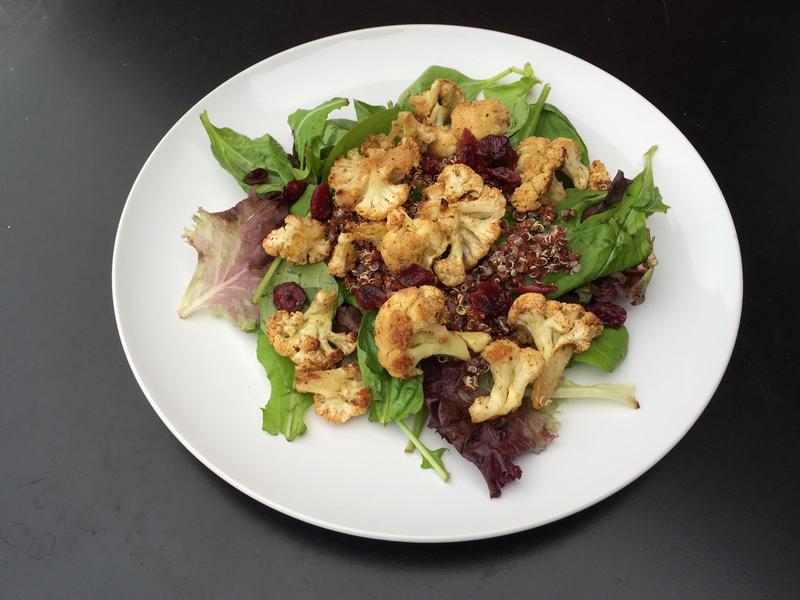 To round out the flavors and nutrients in this salad, I combined the cauliflower with some mixed greens, quinoa, and dried cranberries. The cauliflower adds a significant amount of fiber, while the quinoa adds enough protein to make this a well-balanced vegan entree. The cranberries bring a sweet tang, which contrasts nicely with the spice of the curry. Top the salad off with some mild acid from the vinaigrette, and you have a delicious lunch – great for a lazy Sunday or a busy weekday. Toss the mixed greens and quinoa in a medium bowl with the vinaigrette. Top greens with cauliflower and cranberries and serve immediately. Heat oven to 400 degrees. 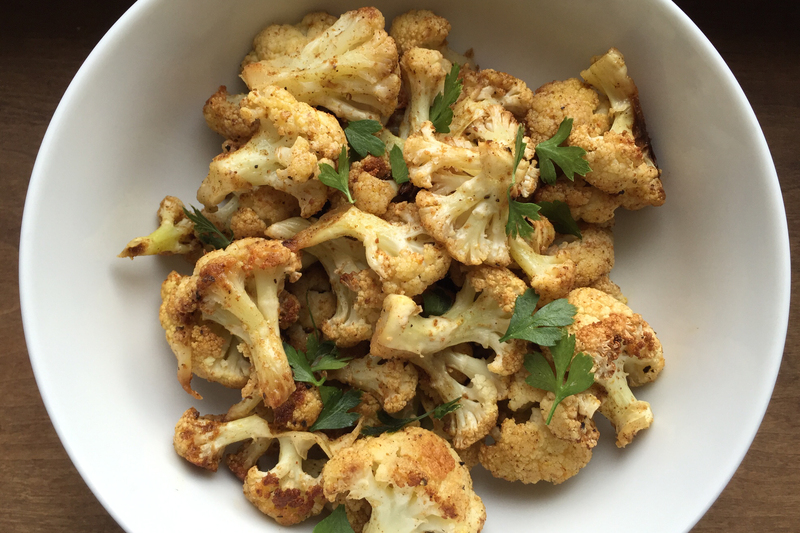 Combine spices and cauliflower in a large bowl. Drizzle olive oil over cauliflower until lightly coated. Transfer to a baking sheet and spread cauliflower into a single layer. Bake for 25-30 minutes, or until cauliflower is tender and easily pierced with a fork. Let cool and top with fresh cilantro or parsley. Combine ingredients in a small bowl; whisk to combine. Refrigerate if not using immediately.